This will probably be our last attempt to offer a steam train in North Korea! 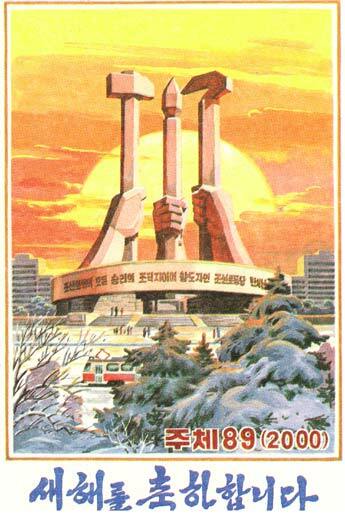 Following the cancellation of last year's Arirang Festival in autumn 2006, the North Koreans have launched a new festival between the birthday of the Great Leader (April 15th) and the day of the foundation of the army (75th anniversary on April 25th). The last serviceable steam locomotive, a Japanese built narrow gauge 2-8-0 is currently overdue for scrapping. Officials wanted to scrap this loco in September 2006. They even dismantled the line! However, after lengthy discussions, we have persuaded them to reinstate part of the line. China is paying good money for all the scrap they can get, so the decision to scrap the railway is an instruction from the top! The local management can do nothing about it. So after our steam operation in April this year, it will be the final end for North Korean steam. 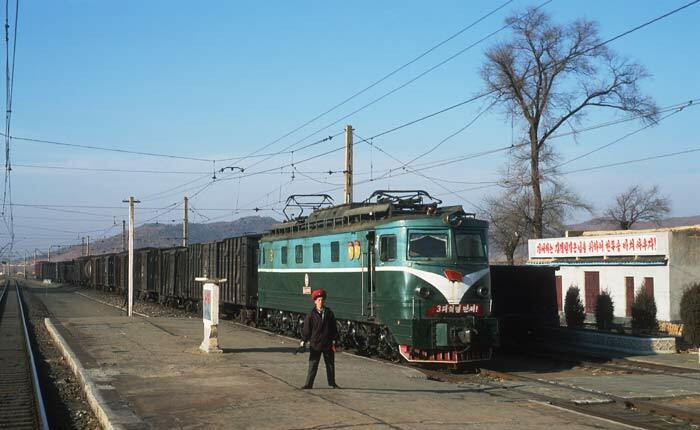 The only chance to save this Class 810 locomotive is to buy it and bring it out of North Korea (more information in the Summer 2006 online-newsletter). North Korea has a unique political system and it is always hard to arrange trips to that country. 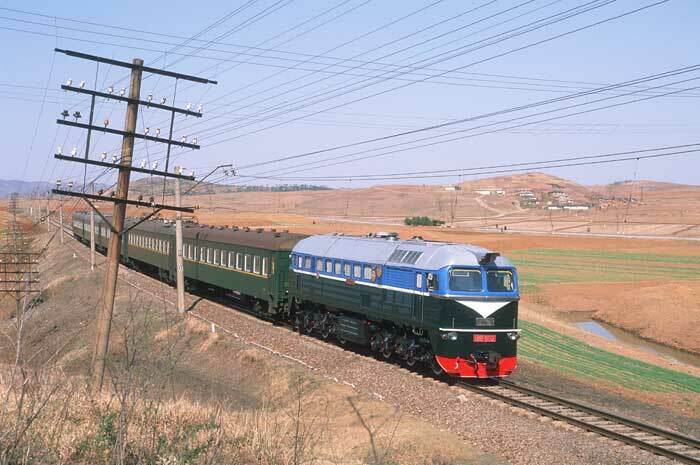 After several successful railway trips into the DPRK our partners in Pyongyang know how to satisfy railway enthusiasts. They’ll do everything to make another successful trip. 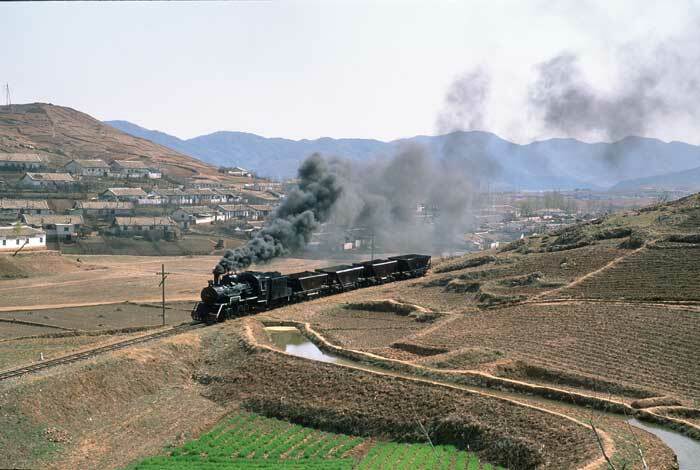 Steam in Korea is running on its very last leg so do not wait until the last locomotive has gone, or until a politician decides to block any further travel into a fascinating and unique country. Our new itinerary covers lines which were not part of any other programme before. As the North Koreans scrapped our standard gauge steam locos which have been reserved for the special trains we laid the focus on the well know Russian class M62. The tour is designed for the dedicated railway enthusiast, as well as for people who have a general interest in the country. To complete the feeling of a surprisingly different political system we’ll show you the place where the Great Leader, Kim Il Sung, was born and the mausoleum were he is presented to the public now. Please be assured that you can expect absolutely first class pictures with professional managed trains. The Koreans know what we want and they will do their very best to make this extraordinary event come true. Our unique tour will give you outstanding value for money. In the morning the last accessible steam loco awaits our arrival in Cholgwang. We’ll use it with a short freight train on the rebuilt part of the line towards the mines. After we leave this place, the loco will probably never steam in it's home country again! Kujang to Muksi are only a few kilometres. Anyhow, the line is very beautiful and offers plenty of possibilities. Five line shots are permitted, including a long, flat bridge over a river. The line is not electrified. As it is a branch line which hardly sees any traffic we’ll have all the time we need for our photo stops. The line heads to the west, so we arranged the visit in the afternoon for perfect light conditions. This line was never visited before by westerners as it is in a restricted area. 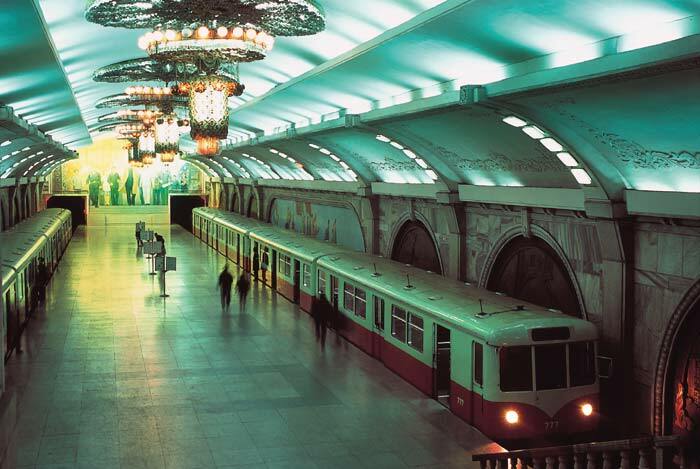 Our visit to the capital city of Pyongyang includes a tour on the world-famous metro system. The Pyongyang Metro is reportedly the deepest in the world, more than 150 m below the surface, and as such part of a huge underground system into which the two million people of the capital could be evacuated in case of an attack on the DPRK. The design of some of the stations is breathtaking, thanks to the lavish use of marble, chandeliers, impressive sculptures, carvings, mosaics and other murals. 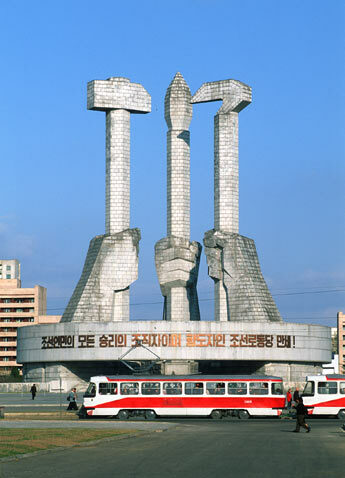 Many of the latter depict the founder of the country, president Kim Il Sung. The names of the stations like “Torch,” “Glory” or “Liberation” surely sound exotic to western ears. 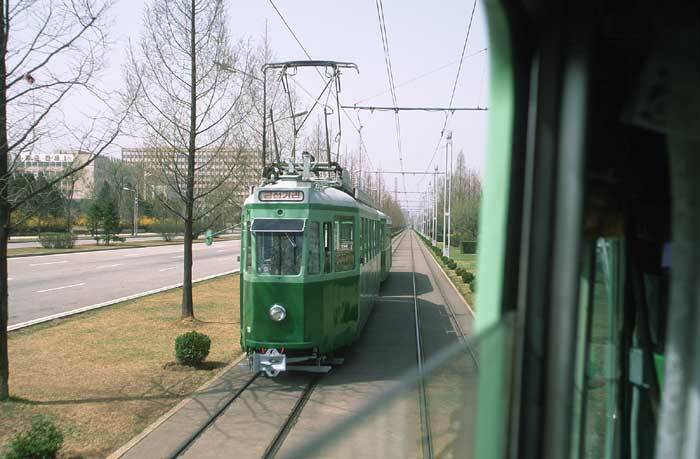 Another important part of the mass transit system are the Pyongyang tramways. The cars originate from formerly befriended countries of the European socialist block. A special ride through the grand city of Pyongyang with its monumental socialist architecture and beautiful parks will be a part of our itinerary. From the city to the mausoleum of Kim Il Sung they built a short metre gauge tram line which is operated by Zurich trams. 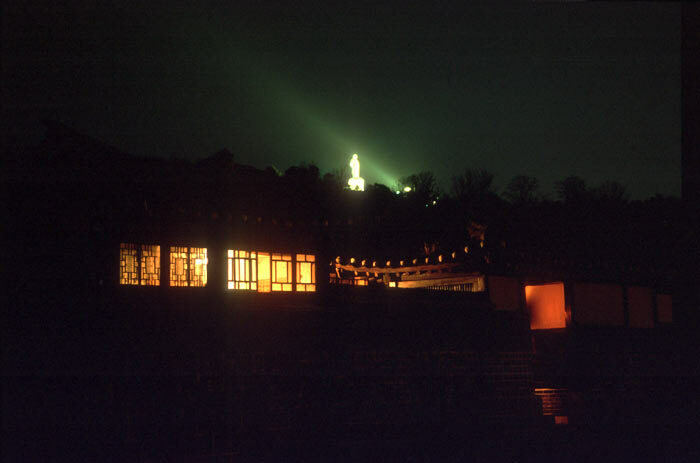 If the Kumsusan Memorial Palace is open to visitors, this line will be operated in the morning from about 9 am. A visit to the tram depot was never permitted, so we have to keep our fingers crossed that the mausoleum is open. Our trip to Beijing will be by international train, surely an opportunity for priceless observations of this rarely visited country. 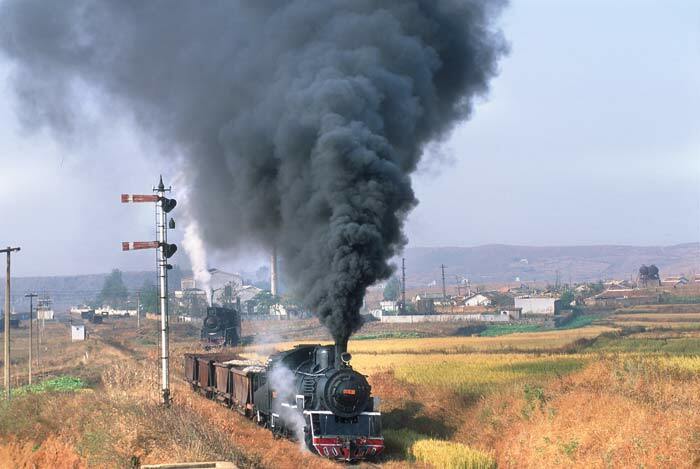 In Sinuiju, North Korea, steam locomotives were spotted during trips in the last two years. These are used for branch line and shunting services. 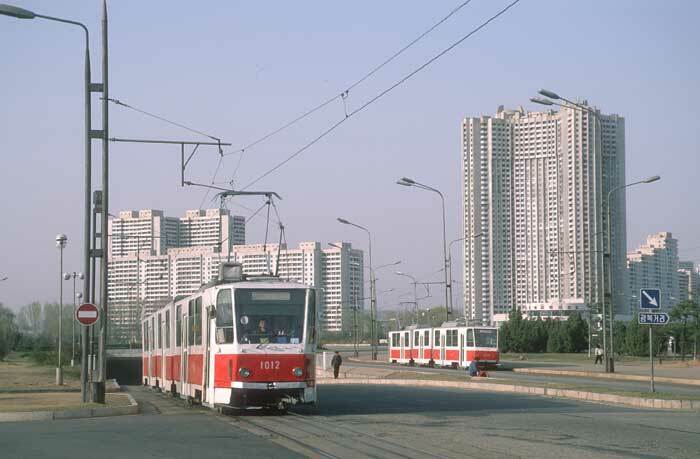 Other than that, various types of the locally-built electric “Red Banner”-class as well as several diesels of the Chinese DF4-types or Soviet-made M62 “Taiga Drums” can be seen. The visit to the Kumsusan Memorial Palace (mausoleum of Kim Il Sung), depends on our behaviour on the first days. The required dress code is a suit plus tie for gents and appropriate clothes for ladies. Due to unpredictable maintenance work at the mausoleum this visit is subject to cancellation with short notice in advance. The North Korean authorities will check your identity very careful. For obtaining the visa we have to give several personal dates and details including employer and profession. Please expect that they'll call your employer and ask whether you have given the correct information about your position. Journalists are not allowed. North Korea is very sensitive regarding information that is published. So please note that all film and video records are for private use only. If you wish to publish reports about this trip, please contact us in advance. We'll find a solution that will not harm our partners in Pyongyang (you would risk that our partners who arranged the trip will at least loose their jobs  at least!). Please be honest when you state your occupation. They will find out and may cancel the full trip in case of untrue statements. The North Koreans will monitor us during the trip. If you want to make a photograph or a video outside the permitted places, please ask in advance. This is simply to avoid trouble. On train rides we'll try to maximise the results (photo & video). Sometimes it is somewhat difficult to go beyond the agreed and permitted arrangements. Charter buses and trains represent the standard of our host countries, which may deviate from American and European expectations. While we will try to avoid long walks, some photo positions may require a bit of an extra effort. The itinerary is designed especially for photographers and video filmmakers. Temperatures are expected to be in the range of plus 5 to 20 degrees Centigrade (40 to 70 degrees Fahrenheit). The autumn season is often dry and sunny and a beautiful time of year for travel. The hotel in Pyongyang is a five star hotel. Please be prepared however, that food isn't available in unlimited quantities like it is in China. Full board is included, but lunches will sometimes be simple, not to say "basic", especially during special train rides, while dinners are usually good. Alcoholic beverages are not included in the tour price, but are usually available including good beer. Please note, mobile phones are not allowed in North Korea. You have to hand over your mobile phone to officials and will get it back on the last day of our tour. Laptops are allowed. Voltage is 220 V, 50 Hz in both countries, North Korea and China. An adapter for the outlet is necessary. In the DPR Korea it is not guaranteed that the voltage will be sufficient to recharge batteries in the time normally needed. Please be prepared and consider taking extra batteries. 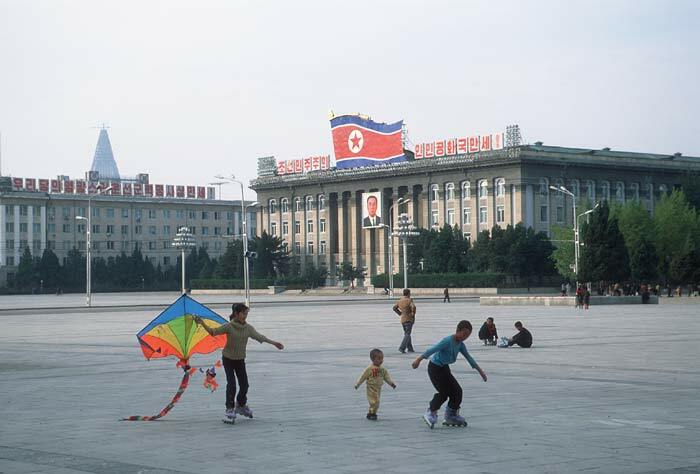 Further information about special conditions in North Korea is supplied on request. Registration period ends January 6th, 2007. Single rooms are not available on the overnight trains. Land Only: Please deduct £405 from the tour price. Minimum number of participants is 10. The maximum number of participants is capped at 30. Tips for local tour guides, bus drivers, train crews etc.